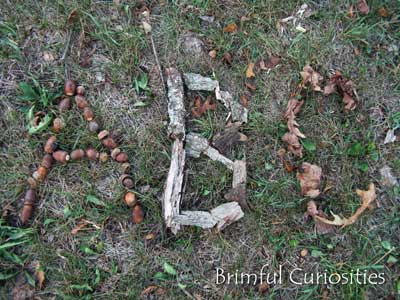 While waiting for the school bus to arrive, my son and I gathered some items from nature and practiced writing the first letters of the alphabet. I find it hard to believe that autumn is in full swing and the leaves are already changing colors and falling to the ground. Our summer passed by quickly and despite the fact that I didn't blog about our activities, our days were full of fun activities and plenty of books. The ABC game also provides me a good way to remark on my blogging hiatus.